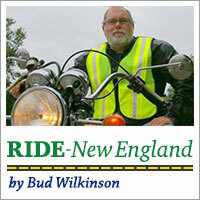 SOUTH DEERFIELD, MA – Being hit in the face by a bug is one of the hazards of riding a motorcycle. 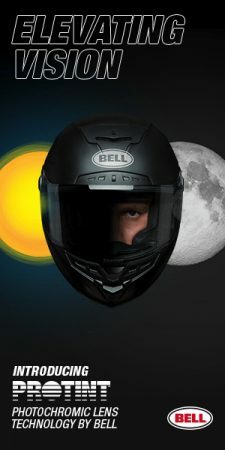 If it’s a good-sized insect, it can sting quite a bit, but that’s still preferable to having a bee slip inside your helmet when the visor has been cracked to allow some air flow. All you can do as it buzzes before your eyes is firmly apply the brakes, pull over, and carefully remove the helmet. If you’re lucky, you won’t get stung. It was on a ride late last summer that I had a vastly different kind of encounter with an insect. 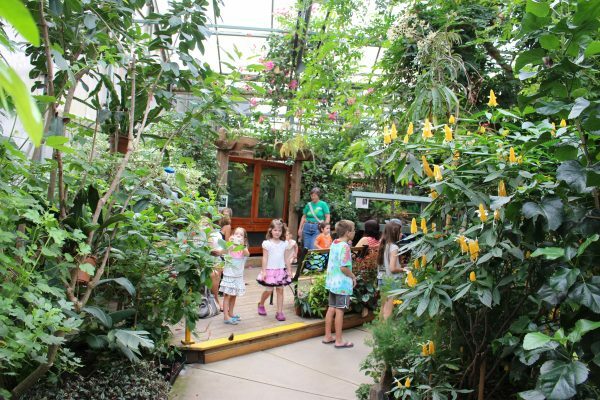 The location was inside the conservatory at Magic Wings Butterfly Conservatory & Gardens. It was there that a butterfly landed on the tip of my nose. Its unexpected touchdown prompted me to freeze and begin counting the seconds. The butterfly remained stationary for a minute or more; to the point where other visitors noticed, paused and chuckled. Becoming a butterfly perch was the highlight of that day’s ride through the Pioneer Valley. 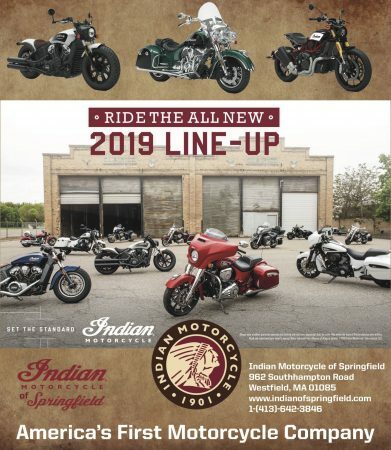 Rather than take I-91 north out of Connecticut, I opted for back roads to West Springfield, Mass. 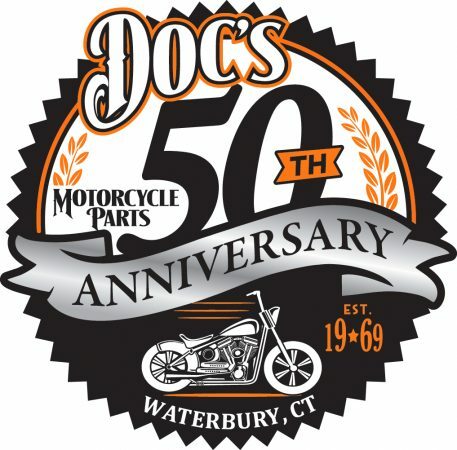 to pick up Route 5 on west side of the Connecticut River. The road wasn’t great but it was early enough that there wasn’t much traffic. The road becomes jointly-designated Route 5 and Route 10 north of Northampton and urban scenery gives way to rural farmland. The road repeatedly crisscrosses I-91 but is worth at least a one-time effort. It’s not that the countryside is that stunning, it’s because of some of the old structures along the way. 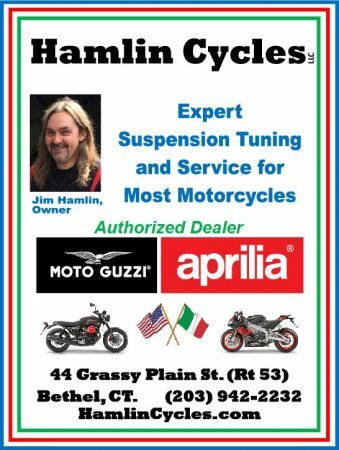 If you close your eyes, not a wise thing to do on a motorcycle, you can imagine how the route appeared in the 1940s and 1950s. Having passed the Yankee Candle headquarters and flagship retail complex, I proceeded on another 2½ miles to Magic Wings at 281 Greenfield Road (Routes 5 and 10) where I was greeted by general manager Kathy Fiore. She quickly clued me on all the relevant statistics before taking me on a tour. The centerpiece of Magic Wings is an 8,000-square-foot glass conservatory. 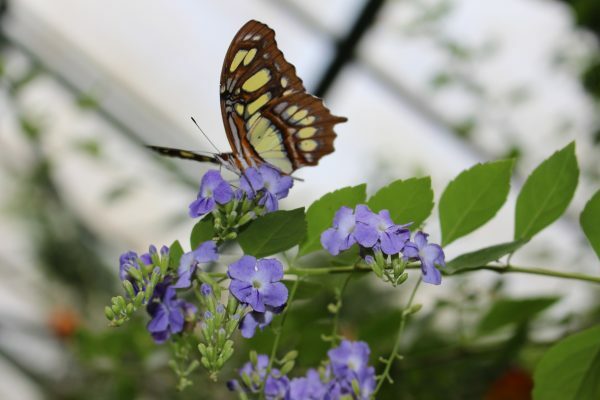 It is filled with 4,000 native and tropical butterflies representing 35 species from seven countries. They live in a tropical setting where the temperature is maintained at 75 to 80 degrees. “They don’t like to fly if it’s too cold and they don’t fly if it’s too hot,” Fiore explained. 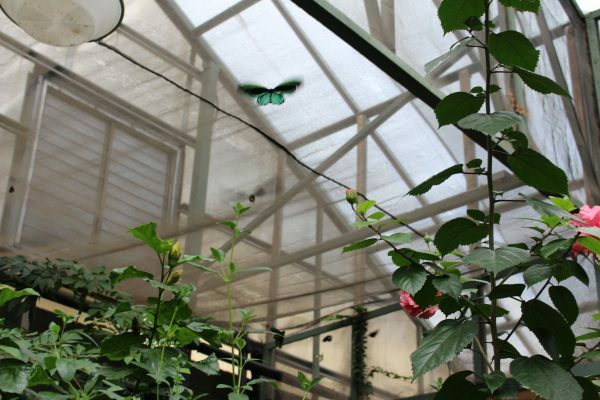 Magic Wings has a propagation program to constantly replenish the butterfly population. Butterfly eggs get collected daily. From them, come the caterpillars. This stage last two weeks until the caterpillar becomes a pupa (or chrysalis). 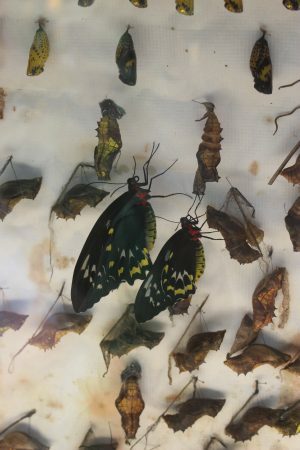 A “nursery” display enables visitors to observe new butterflies emerging after having spent another two weeks in the pupa stage. Attention is also paid to the vegetation inside the conservatory. Plants get rotated and there’s a separate tropical greenhouse to maintain the supply of greenery. Now in its 15th year, Magic Wings is open seven days a week year-round. It’s only closed on Thanksgiving and Christmas Day. Admission is $14 for adults, $12 for seniors age 62 and older (except on Wednesday when it’s $10.50), and $10 or children 3 to 17. Strollers are not allowed in conservatory or gift shop. Fiore’s enthusiasm for butterflies made the visit enjoyable, but wandering in the tranquil setting at her suggestion after she completed the tour produced a feeling of serenity. 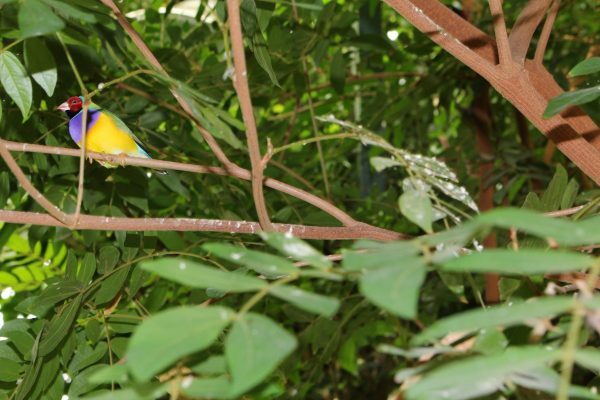 Getting to see some Gouldian finches, which are native to Australia, inside the conservatory was also a treat. “What amazes me the most about it is watching other people’s enjoyment. 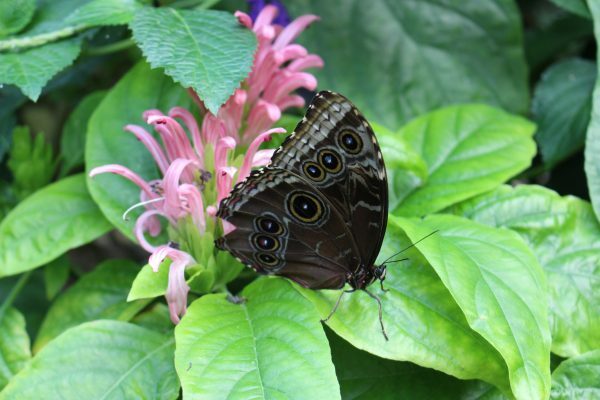 A lot of people when they hear of a butterfly conservatory don’t know what to expect. Inevitably, people are fascinated,” Fiore said. I don’t recall what prompted the ride to Magic Wings. Not being interested in entomology, I was skeptical that Magic Wings would be entertaining. All it took to change my mind was for a butterfly to land on my beak. And is sure beat the heck out some other type splattering on my face while riding. Magic Wings is a very enjoyable and peaceful place to go. We went in the winter. Cold outside, nice and warm inside.